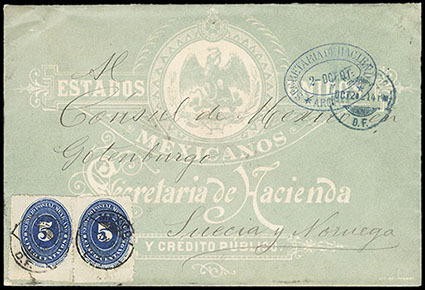 Mexico, 1890, Numeral, 1c green, in combination with 1890, Numeral, 2c carmine, two singles + 5c blue, combined with New Zealand ½d + 2d pairs on the famous McKellar cover which was the subject of an extended article in the Collector's Club magazine, this cover originated in New Zealand and was addressed to Muzquiz, Mexico, on arrival it was added the 5c stamp and forwarded to Las Vegas, the family had then returned to Muzquiz so the cover was sent back a second time, by the time it arrived back in Muzquiz the family had moved to Pasadena so it was added another 5c (1c & 2c) and finally sent to the U.S.; opened at sides for display, F.-V.F., a unique franking. Scott No. 212+213+216 Estimate $400 - 600. Mexico, 1890, Numeral, 1c green, in combination with 1892, Numeral, 3c + 4c + 10c orange issues on 1893 G.B. 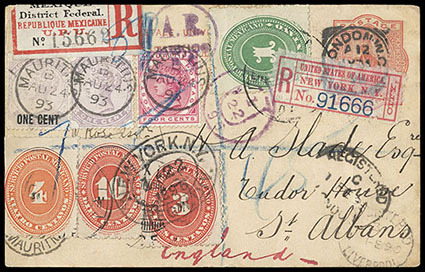 registered postcard mixed with Mauritius stamps, sent originally from London to Mauritius on July 1893, then sent back to London with added Mauritius stamps, then traveled privately to Mexico, where it was then mailed to San Albans, GB in January 1895, Very Fine, a unique combination. Scott No. 212+222-223+225 Estimate $200 - 300. 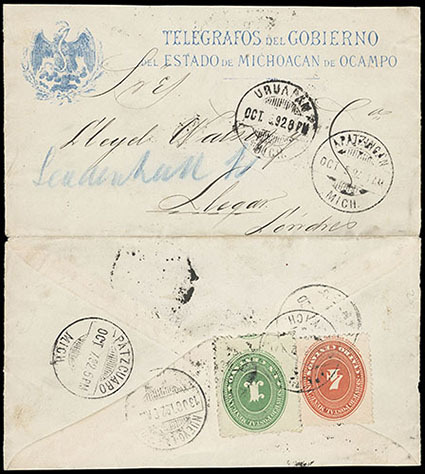 Mexico, 1890, Numeral, 1c green, in combination with 1890, Numeral, 4c vermilion on reverse of rare "Telegrafo del Gobierno del Estado de Michoacán" cover to London, England, tied by 1892 Apatzingán origin cds with various transit cds's, probably included the contents of a telegram and used the postal system to send it, also included is a Federal Telegraph cover addressed to Encarnación; first cover opened at sides for display, Very Fine, since the telegraphs in Mexico were state owned, this official correspondence is very rare, ex-G. Kramer. Scott No. 212+215 Estimate $150 - 200. Mexico, 1890, Numeral, 5c blue, two singles, cancelled by 1891 Mexico cds's on bluish green "Secretaria de Hacienda" overall official cover to the Mexican Consul in Gothenburg, Sweden, appropriate transit backstamps, Very Fine. Scott No. 216 Estimate $250 - 350. 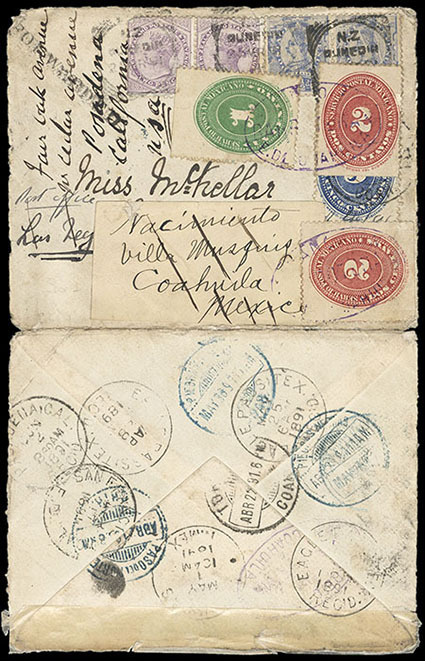 Mexico, 1890, Numeral, 5c blue, on combination with 1890, Numeral, 10c vermilion on 1895 registered cover to Chicago, Ill., tied by Japala cds's with matching R handstamps, registry etiquettes and various transit date stamps, Very Fine and choice (no photo). Scott No. 216+218 Estimate $150 - 200. 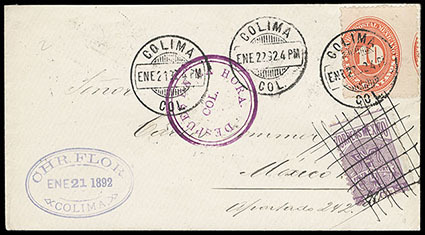 Mexico, 1890, Numeral, 10c vermilion, tied by "Colima, Ene 22.92" cds on cover to Mexico, cover initially without franking with Colima cds the day before at center and purple "Falta de Porte, 20 Cts" deficiency label affixed with additional "Después En La Hora, Col." handstamp, label crossed out after stamp applied, Very Fine, a rare usage. Scott No. 218 Estimate $300 - 400. 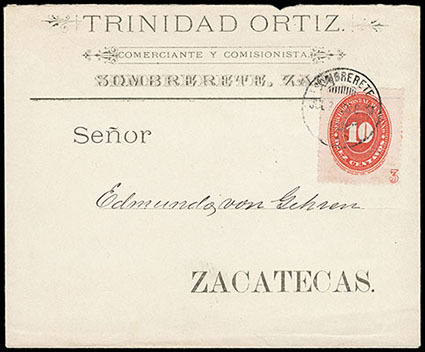 Mexico, 1890, Numeral, 10c vermilion, showing plate number "3" in margin at bottom right, on advertising cover to Zacatecas tied by 1894 Sombrerete cds, Very Fine, an extremely rare variety on cover. Scott No. 218 Estimate $200 - 300. 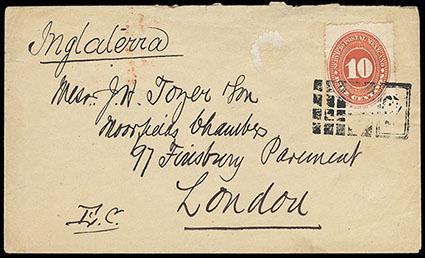 Mexico, 1890, Numeral, 10c vermilion, tied by railroad grid handstamp on 1893 cover to London, England, reverse with red London receiver and large blue "Forwarded By The International Transfer's Co…., City of Mexico" handstamp, Very Fine, an unusual combination usage. 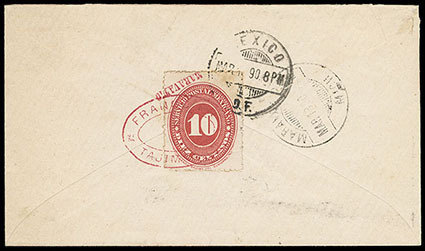 Mexico, 1890, Numeral, 10c Vermilion, perf 12, Maravatio, red district overprint tying stamp on reverse of cover to Mexico City, tied by red Tajimaroa oval, Maravatio transit and receiving cds additionally tying stamp, accompanied by used 10c lilac (Sc 180) with Maravatio overprint and used 10c orange (225, small thin) with purple Guadalajara overprint, Very Fine, the system of district overprints had ended in 1883, but occasionally district overprints are found, very rare with cover likely unique. 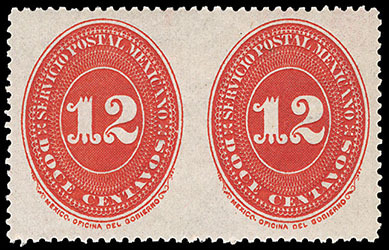 Mexico, 1890, Numeral, 12c vermilion, imperf between, horizontal pair, o.g., lightly hinged, exceptional centering, bright and fresh, Extremely Fine.